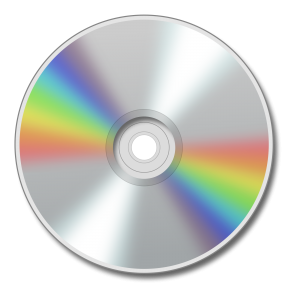 With a compact disc (CD), you can see the visible spectrum of light. Hold the CD under a bright light, and slowly tilt it back and forth. You should see lines of color radiating out from the center. If you look closely, you can see the order of the visible spectrum (sometimes reversed) in the color patterns. The CD stores information in thousands of tiny grooves on its surface. When white light hits the grooves, the light bends to travel around the grooves. Different wavelengths bend by different amounts (the amount also depends on the angle at which the light hits the CD). Since different wavelengths bend by different amounts, the mixed-wavelength light hitting the CD spreads into a visible spectrum, with red at one end and violet at the other.